Go where the work is! 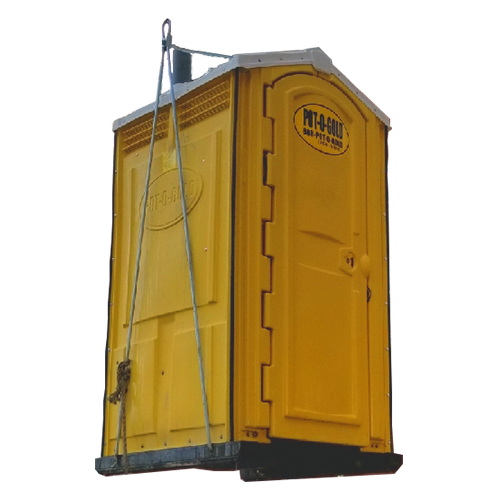 Pot-O-Gold’s Porta Potty with Crane Hook rental option offers high-efficiency conditions for construction because of it’s heavy duty metal sling which allows the unit to be transported to the highest of high-rise construction sites! Services provided by Pot-O-Gold are performed by professional technicians using the best equipment our industry has to offer. Our porta potties undergo our amazing 7-Point Service Plan to ensure your porta potty rental arrives in pristine, like-new condition and is kept that way throughout the duration of your project. We recommend (1) porta potty per (10) people. Translucent ceiling which provides plenty of light from any and all outside light sources. Ventilation Pipe to reduce odors.